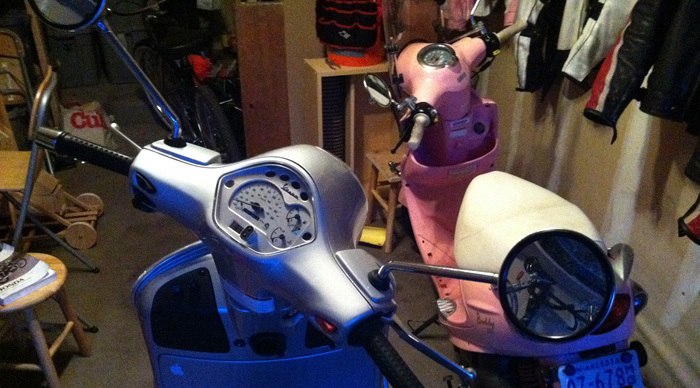 April 2, 2011 — It was mostly cloudy, about 50º F and my Vespa was finally back in my garage. I’d been itching to ride, but I had a more practical need. This coming weekend I take delivery of a rather large motorcycle — a 1983 Honda GL1100. With all of an hour of riding under my belt in 2011, the last thing I want to do is hop on a 640 lb motorcycle as a rusty rider. So I set out into the gray spring evening on my italian pony. Since moving here to southern St. Paul from the southwestern suburbs, it’s taken me a while to find scooter ride routes that I really like. Though there are lots of hills and plenty of scenic country down here, I have yet to discover many low-key twisty roads that make me want to take the Vespa out. It’s motorcycle country ’round here —which is fine, except I don’t have a moto at the moment. So as I set off on the Vespa, I figured the best ride I could make was my mechanic’s proving loop down Hwy 3. It was a little chilly, if I’m honest. Had the sun been out, it would have been perfectly comfortable. I didn’t care though. It was so good to be out on a bike again. If there was any rust, it wasn’t very thick. If there’s a single thing I like most about riding, it’s that feeling like you’re flying. I couldn’t get real aggressive, as there’s still a lot of grit and yuck on the streets, but weaving through the lanes and touring the gentle slopes of the Minnesota River Valley was clarifying. My favorite part had to be dusting a Nissan Altima whose driver couldn’t figure out how fast they wanted to go. We were side-by-side at a light on Cliff Rd, and when it hit green, I showed him a lot of tail light. Love doing that. I looped back up Hwy 149 and passed Thomson Reuters’ massive corporate headquarters as I entered back into Eagan. I caught a glimpse of a windy road wandering back into the residential areas off the main road. Turns out it dog legs back onto Hwy 3. Good stuff — I’ll have to remember that. Making the penultimate turn back onto Yankee Doodle Rd, a V formation of canada geese flew overhead. It must be spring after all. They were headed vaguely in my direction and to my surprise, were going almost as fast as I was. Watching those geese cruise along, seemingly right along with me, I couldn’t help but feel optimistic about this riding season. With my second hour of riding wrapping up, my thoughts turned to that naked Goldwing I’m about to pick up. I can’t wait to stretch its legs now. Twitter encouraged me to go pick up my bike from Bluecat on saturday. I took a very chilly ride down hwy 55 on sunday that was well worth being a little cold. Let me know if you find any good scooter rides around town. I hardly got out on the vespa last year. The scoot is perfect for a lazy sunday afternoon tour.